#Brunei Foodies Pink Desserts recipe book is here! The book will cost $10 and will be available at the Bloggers Bazaar this weekend. So don’t miss the chance to get a copy (or two) and also enjoy various delicacies that will be available on that day. The book is on a limited print, so it is instantly a collectors item! All proceeds from the sale of the book will go to the Brunei Breast Cancer Support Group. See you there! The book is now available at Book@Sarah (Sri Q-Lap Mall) and also Frangipani in Sengkurong (same block as Baiduri Bank). I can’t remember when and where did I have my first taste of KFC. But I do recall I’ve always ordered the Original flavor despite being a big fan of everything spicy. The usual Spicy flavor was good enough for me but this Black Pepper Crunch really hits the spot. You know how you get like tiny sweats around your nose and forehead when you eat something spicy? Well this one will bring out that effect. I really love this flavor and I hope it’ll stay a little bit longer than the two months (or until they run out stocks) promotion they’re doing for it. So far some of friends have tried it out and they’re all giving it a thumps-up. Just be sure to buy extra drinks. #BruneiEats by @kurapak. Pizza Hut yummies! Now I’m in the mood some pizza! After months of seeing the “Opening Soon!” banner, this restaurant finally opened, albeit a soft opening one. Restoran Buffalo Steakhouse (RBS) is located where Sugarbun used to be. The set-up is pretty alright, nothing fancy, reminds me of the deco of the Dim Sum Restaurant near Unitek. When we got there, the place was quite buzzing, but not full. Farah & I decided to sit outside as I find the indoors too cold. We sat at table 22. As soon as we were seated, one of the waitress came to us handing the menu and then just stood there ready to take our order. No welcome or small talk. This always makes me feel awkward & pressured, so I told her to give us 5 mins and we’ll call her back. The pricing was very steep. If you think Charcoal BBQ & Grill, RBC outlets and Empire is expensive, then you’d have quite a shock looking at some of RBS’s prices. So anyway, we took nearly 10mins to decide what to order. Finally I decided on Escargot (half dozen $9.90) and Ribs Steak ($39.90) while Farah opted for the Prawn Coktail and Chicken Combo (not sure what the name is but it’s Chicken + Prawn). Farah ordered Ice Lemon Tea and I ordered plain Ice Tea and specifically told the waitress, Teh O, no milk. Ok before I go on, I would like to clear a few things. This post is in no way intended as a slander to this new establishment. It is purely to give an honest feedback and provide positive criticism. I believe RBS has potentials and I would like to see it as a popular eatery in our rather small foodie industry. I hope the owners will be able to improve their services in the future. I want to be able to recommend visitors/tourist to our country to give it a try in the future. So back to my story. Our drinks came about 5mins or so and as I somehow expected, they got my order wrong. Mine came Milk Tea. Obviously, I asked for it to be changed. Farah’s main course, Chicken Combo came about 20mins or so. 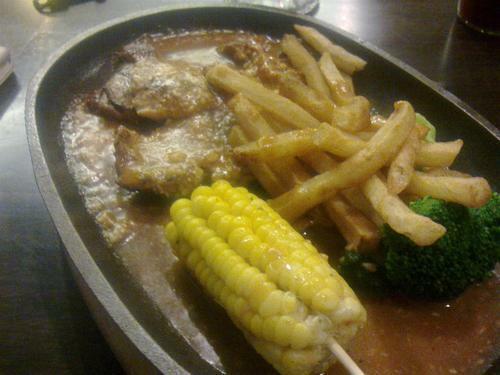 The waitress said it was a Sizzling Chicken Steak. After a little confusion, Farah accepted the order and only to realized it’s the wrong order! Not wanting to make a fuss, Farah had her food. I think as you can see from the photo below, the food presentation was simply zero. The fries were all soggy and tasteless and the sauce is bland. At around this time, its almost near the 45mins mark since we ordered our food. Our appetizer is still not on our table. Inside I can see someone who I assume to be the boss, busy checking on some customers who seemed to be his friends. He was even carrying food for them. He kept looking at our table but never came to us to explain what is happening. We see a lot of commotion, waiters & waitresses walking quickly here and there. I also noticed that a young girl – I’m guessing 12yrs old & the owner’s daughter – behind the cashier and doing the billing. There was at least 4 people behind that cashier as if arguing about the receipts. And at one point, the young girl was even taking orders at the table near by! Anyway, after an hour, I call one of the waitress and told her I want to cancel the rest of the order and just to bring me the bill for what has been served. She finally came with the bill and on it, Farah’s meal was labelled as Cordon Bleu! Now look at that photo above again, does that look like Cordon Bleu? Feeling rather frustrated already, we just paid and left. The waitress said sorry and that was it. No manager or person-in-charge came to explain to us what happened. They could also have given us some discounts to get on our good side. But none, no apology at all or kind gesture. 1. SERVICE is key. No matter how beautiful your restaurant is, how wonderful your food is, if your service is zero, no one will come back. I don’t think I need to remind you how small the local market is and word of mouth can either make or destroy an eatery. Please train your staff to speak up and be attentive to the tables they serve. Make them check on orders of the table they attended from time to time to make sure everything is in order. Set them to an area or table numbers that they would be in charge of to service. 2. MENU. Frankly it’s a mess. Pictures of food are cropped so tightly and almost every food items looks the same i.e. some sauce poured over it. The menu badly needs a make-over. And please hire some good photographers to take proper photos of your dishes. They are very talented locals who can make your food look extra good. Of course you will have to match the taste for it. 3. FOOD PRESENTATION. This seriously needs a lot of work. To me it is just sloppy. You are charging a very high price, so at least please try to make it look what its worth. 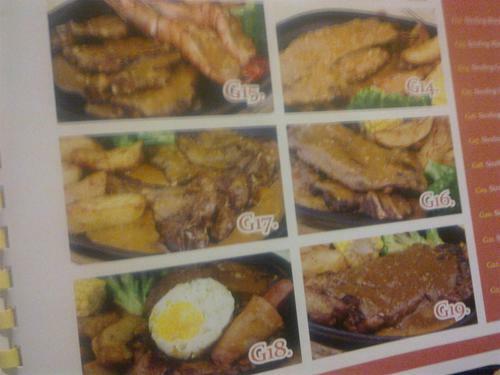 The sizzling plate is overdone, even the mamak shops are using that, find creative ways to serve your food. 4. ORDERING. I notice your waiters/waitresses carries a board with a paper listing the menu which they simply tick to get the order. I suggest you guys just put the board/order paper on the table and let the customers decide and tick their order, just like what Taurean do. I think it gives a peace of mind and it doesn’t rush the customers to decide on their order. 5. TRAINING. I can’t stress this enough. Your staff should be able to interact with the customers. They must be confident to make recommendations and get the order right. I think anyone would feel very unhappy when orders are messed-up, so get it right the first time. I remember as I was leaving, the patron next to us was saying to the waitress that she got the order wrong. I would also suggest to have designated cashiers, don’t just get anybody to do the billing. Your manager should be checking from one table to another at least once to ask the customers if everything is in order, especially when it’s your first day of business. I think that would be all I have to say. I’m sure in the days to come I will come across tweets and comments from others. I do hope they’ll have a better feedback. I’m gonna give RBS a few months before I come back, hopefully by then things will be for the better. My sincere good luck to the management.